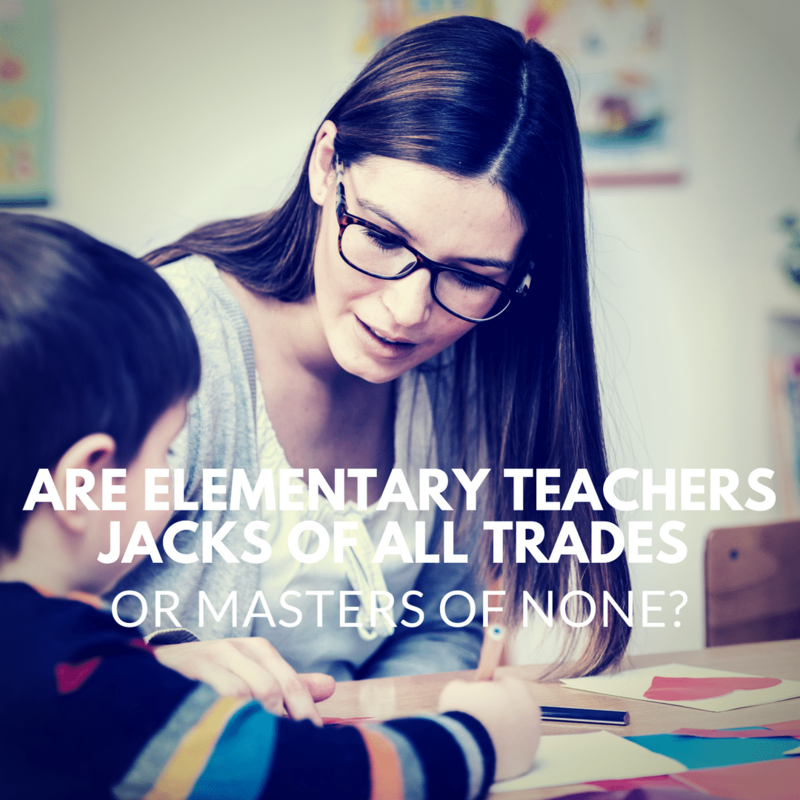 Are Elementary Teachers Jacks of All Trades or Masters of None? Recently, I was facilitating a discussion with high school teachers about Kylene Beers book When Kids Can’t Read What Teachers Can Do – A Guide for Teachers 6-12. In chapter four, Beers explained that one of her students did not understand how to find the main idea and that she did not do a good job of teaching him how to find it explicitly. After reading the chapter, teachers were concerned this secondary student still hadn’t mastered this skill. I asked the group of teachers, “Do you know when the main idea is first introduced in our Indiana Academic Standards? They didn’t know exactly. K.RN.2.2 With support, retell the main idea and key details of a text. 1.RN.2.2 Retell main ideas and key details of a text. 2.RN.2.2 Identify the main idea of a multi-paragraph text and the topic of each paragraph. This school year, I teach high school English part-time and coach teachers in literacy during the remaining part of my day, but the first eight years of my twelve-year career in education was spent teaching middle school English. When I was at the middle school level, I had the same question, “What is going on in elementary school?” I wanted to know why my students had not picked up certain skills or not obtained mastery in others and don’t get me started about the students who showed up to 7th or 8th grade reading at a 2nd or 3rd-grade level. But if you want to know what is happening in elementary school, you have to work in one. I spent the three years in between being a middle school English teacher and my current role working in two different elementary schools. In one school, I was a K-5 English language learner teacher and in the other school, I was a K-6 literacy coach. One school was rated an A and the other was rated an F. In my role as both an English language learner teacher and as a literacy coach, I spent time in almost every classroom in each building. That’s when it became clear to me what was really going on in elementary schools – too many elementary teachers were jacks of all trades and masters of none. Regardless of the rating of the school, some elementary teachers did not know the content for all subjects at a high level. This was the reason students showed up to middle school unprepared because their teachers lacked the depth of knowledge in all of the subject areas. Below, I have outlined what I noticed during my three years at the elementary level. If elementary teachers have a strength, it is in their focus on reading…it doesn’t mean they always teach it well, but they typically make sure students read. If a school has extra money in its budget to hire an instructional coach, many times that person will focus on literacy. When I became an elementary literacy coach the skill gap between teachers became clear. One day, I was working with an upper-grade teacher who mispronounced hyperbole. She pronounced the first part of the word like a hyper child and the second part like a bowl of cereal. The standard we were looking at also mentioned similes and metaphors. The teacher didn’t know the difference between the two and she wasn’t planning to teach the standard until we had a conversation. Literacy is multifaceted and there are many literary genres and skills students need to learn. Elementary schools have to do a better job at making sure teachers understand and can teach all of the components of literacy. A teacher once told me, “I could teach first-grade math well, but I don’t really know what I’m doing now that I got moved to second grade, so I’m just giving them harder worksheets.” Huh, what? That’s not a plan. With math being taught conceptually, which is different from how current teachers learned math, the shift has caused some teachers to struggle with instruction. When elementary teachers are constantly moved from different grades and then land in an upper grade, the teachers might not have mastered the strategies or know how to teach those math concepts yet. I had a principal who used to always say, “Math makes my feet sweat.” Personally, I wanted to double major in math and English…but who wants to be in college that long? I love math just as much as literacy. One day, when a teacher got stuck in the middle of a math question, she told the students to move on to the next question. Once I told her I could explain it, she let me show the class. Would she have gone back to the problem if I hadn’t offered to help? How many students don’t know math because their teacher is stuck on the problem too? Good ‘ole social studies…or do you mean citizenship class? It is important for students to know the various roles in society and how they will take part and add value to our community, but many times this is the bulk of the curriculum. In Indiana, there are four overarching social studies standards for elementary students: Standard 1 – History, Standard 2 – Civics and Government, Standard 3 – Geography, and Standard 4 – Economics. Elementary teachers seem to get stuck in geography or teaching economics and explaining different jobs and needs in our community. Little time is spent delving into history. In Indiana, 4th graders study Indiana history and I will say this is taken seriously. Students look forward to this year of social studies because of the projects and activities they have heard about from older siblings, but shouldn’t students look forward to social studies in every grade? Shouldn’t social studies be more than a Pinterest lesson when MLK day rolls around? Shouldn’t it be more than a quick lesson on the electoral college process when we happen to be in an election year? This puts secondary teachers at a disadvantage when they have to cover basic history on top of the specific secondary history standards. “Shawnta, I don’t even know what the science standards are for my grade; I’ve never looked at them.” I honestly wasn’t surprised. When you are in a school where science consists of watching a Magic School Bus episode while chowing down on afternoon snack, what can you expect? Wait a minute, I forgot that brief lesson on caterpillars, so teachers would have a reason to release butterflies in the spring with their students. This may seem harsh, but a principal I know once said, “What gets tested, gets taught.” Even though we take a state standardized science assessment, it doesn’t factor into accountability, so many times science instruction is cut to double the reading block. I did have the opportunity to observe a rockstar kindergarten teacher teach science on several occasions throughout a school year. She even won the 2014 National Shell Science Teacher of the Year Award. Now, she leads science professional development for other teachers. Science can be taught well in elementary school, but the teacher has to have the knowledge and know the strategies to teach it well. Students shouldn’t show up to middle school clueless about the scientific method. If some of the teachers in the elementary school don’t know how to teach science well, the principal should elevate a teacher who can teach science well as a teacher leader to help his or her colleagues. Elementary teachers don’t want to be responsible for sending ill-prepared students to middle school, so where does this leave us? It leaves us in a bind and I learned that blaming the elementary schools is not the answer. Secondary and elementary teachers must work together. For example, during one summer, I had the opportunity to work on a vertical articulation team looking at the standards K-8 and this allowed middle school teachers to work with elementary teachers to identify areas of concerns. We even looked at what terminology was used when teaching certain skills and concepts. It allowed the elementary schools to realize where gaps were and to develop a plan to help teachers obtain that content knowledge. It allowed middle schools teachers to identify some strategies they wanted to bring into their classrooms to make sure as students progressed through each grade they understood this was a skill they already learned but were building upon in middle school. I understand that the elementary license is a generalist license, but our students need their teachers to have more than a surface level understanding of each content area they are teaching. We might miss out on a student growing up to become a scientist all because he or she didn’t gain a love of science in elementary school because the elementary school didn’t invest in the teachers to make sure they are comfortable with teaching the content area. There is so much wrong analysis in this article I don’t know where to begin. You are making logical leaps by a few comments from colleagues. Being a literacy coach in the younger levels does not translate to understanding what it means to be a classroom teacher. I have done both. Also, I don’t know where you teach but it sounds like the teachers you are speaking with are indeed in need of some professional development. I recommend that you teach K-2 for 5 years and show us how it’s done. Then we can analyze the data on your students. Hi J, I appreciate your feedback and wanted to provide additional context. I’m not sure if this will change your viewpoint, but other people who read your comment might have similar questions. For the last five years, at a university in Indiana, I have taught Psycholinguistics for Teachers of Reading K-12/Socio-Psycholingusistic Applications for Reading Instruction. It is a hybrid undergraduate/graduate course. Students in my class are both elementary and secondary preservice teachers. Twenty seats in the class are for undergraduate students and five seats are available for graduate students. I took this course years before I taught it when I was a middle school English teacher. It helped me teach my middle school students more effectively. My experience teaching this course, as well as my P-12 reading license, allowed me to become an elementary literacy coach. My former principal was looking for an educator who knew how to instruct adults and knew what foundational skills upper elementary teachers needed to teach to prepare students for middle school. During my three years at the elementary level, I either co-taught (which included co-planning lessons in reading, math, science, and social studies), modeled lessons or observed in 30 different elementary classes across grades K-6. I have also coached 24 elementary teachers. The comments and experiences I shared in this article were only highlights as I did not want to belabor the point. One year of my elementary coaching was focused on K-2 classrooms only and this included teaching second graders throughout the entire school year. In regards to data, I believe the academic gains made in the classroom by the teachers I coached speak for itself. I know it was more about their willingness to be risk takers and try different strategies and techniques, but coaches are evaluated based on the growth of the students of the teachers they coach. If elementary teachers’ depth of knowledge in all content areas wasn’t an issue J, then why are more schools departmentalizing the upper grades? That’s the conversation I want to have, not a distraction about whether or not I’m qualified to speak on the topic. So now we are bashing elementary teachers? Sometimes it’s best to wait to teach a skill when it is an abstract concept. I’ve been teaching for 28 years and have not taught a developmentally appropriate curriculum yet. First graders and kindergartens should not be stressed out because of a demanding and “rigorous” curriculum. In my experience most literacy coaches get out of the classroom because the can not deal with the day to day -hour by hour life in an elementary class room. If you want to help get back in the classroom as a classroom teacher. S. Fultz, I agree there are times when curriculum is developmentally inappropriate, but at the end of the day because of accountability, teachers have to be able to help students master the academic standards put forth. Some elementary teachers fail at this task because of a lack of knowledge and/or skill. Coaches are a valuable resource to help teachers. I also agree that some educators go into coaching or administration to escape the classroom, but I know far more academic coaches who are skilled at their craft and work hard to help teachers. It is disappointing that you don’t understand the value of academic coaches and assume the only way an educator can help make an impact on students is by having a classroom. To add some validation in what will probably be a sea of defensiveness, I have witnessed this too (and I am an elementary teacher!). Some teachers really do lack the content knowledge that they are supposed to be teaching, probably because the people who were supposed to teach them didn’t have it either. It’s embarrassing to admit (even just to yourself) that you don’t know “easy kid stuff.” But, once you take that first step and recognize that you have some knowledge gaps, it’s fairly easy to remedy them and become a better teacher than you were before. I regularly see the type of examples you’re talking about in your article where the elementary teacher’s lack of content knowledge harms the instruction. I’ve also noticed that when a teacher is uncomfortable with a topic, the students are able to sense the anxiety. In turn, this causes them to become anxious as well. I can see from reader reactions that your article was not well-received by all. I think this would be a good time for teachers to do some self-reflection. What subjects make you uncomfortable to teach? Why? What are you going to do about it? If teachers could ask themselves these questions honestly, then they could work on improving those weak areas.